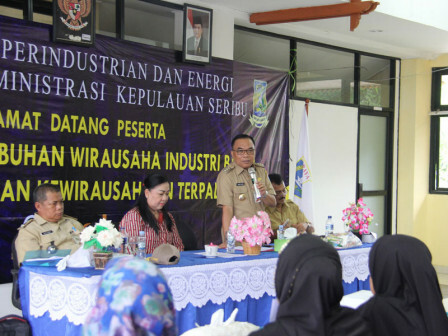 Thousand Islands Industry and Energy (PE) Sub-department opens cooking class as a part of new industry entrepreneurship training program for Lancang Island and Pari Island residents, South Thousand Islands.
" This training is important to encourage Thousand Island residents to create and develop their own business"
It is opened by Thousand Island Regent, Husein Murad at Pari Urban Village Office Hall on Wednesday (4/10). "This training is important to encourage Thousand Island residents to create and develop their own business," he mentioned in his welcoming speech. According to Thousand Islands PE Sub-department Head, Melinda Sagala, fishery products are chosen to be the main ingredients for today's cooking class. "It's easy to get. Moreover, we have to utilize the potential of our natural resources," she stated. For information, 40 participants which are mostly housewives gathered on the location and learn to process seafood into various dishes in this cooking class. Besides, they also learn how to bake cookies.